We had a lot to look forward this morning when we woke up, but little did we know that the day would have an unexpected end in Gettysburg. The terrain was relatively flat throughout the day, so we were able to hike almost 18 miles in about 7 hours. That must be a record for us! We hiked with Prometheus and Chaser for most of the day and ended up meeting up with Phys Ed again a few miles before Pine Grove Furnace State Park. The last time we saw him was before the Shenandoahs, so we were excited to meet up with him again near the halfway point. Before we finished off the last few miles of the day, he offered for us to stay with him in Gettysburg for the night at his home. 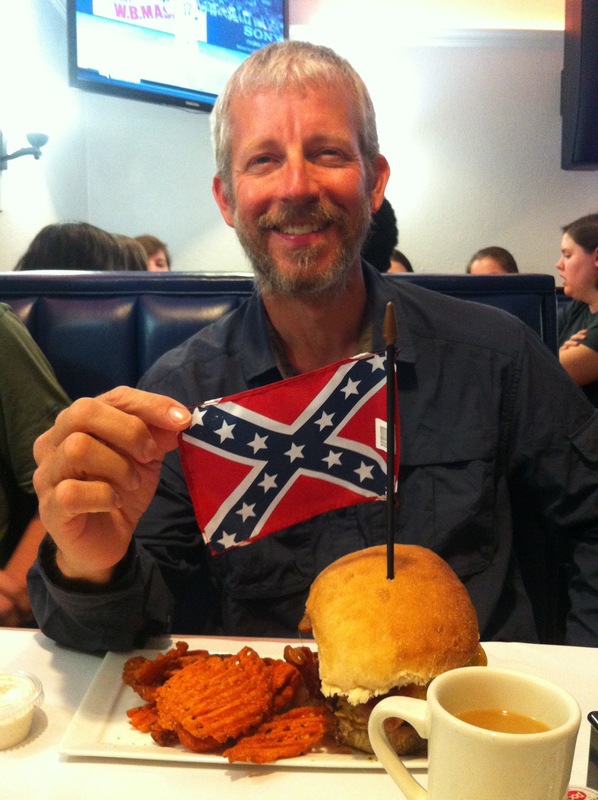 When Miles and I first began the hike, we thought it would be cool to go into Gettysburg once we reached Pennsylvania. We had no idea that we would actually get to go there, so we decided to take Phys Ed up on his offer! We were more than excited. To backtrack a couple of miles from there, we unknowingly passed the halfway point near a gravel road. 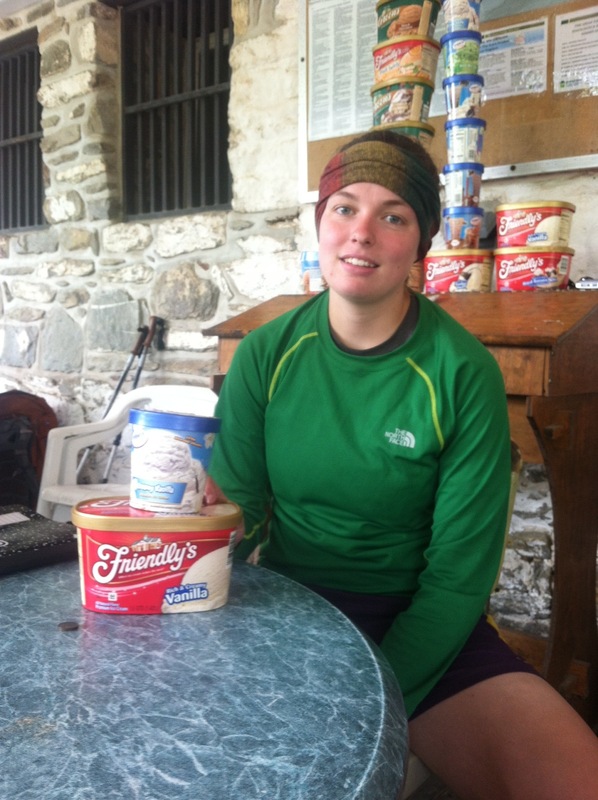 Our guidebook mentioned the 2013 halfway point, but there was no sign to mark it, so we had no idea that we had reached that point until we got to the Toms Run Shelters which we knew were past the halfway point. We both knew that there was a big sign marking it, so we assumed it was just ahead, a couple of miles off. 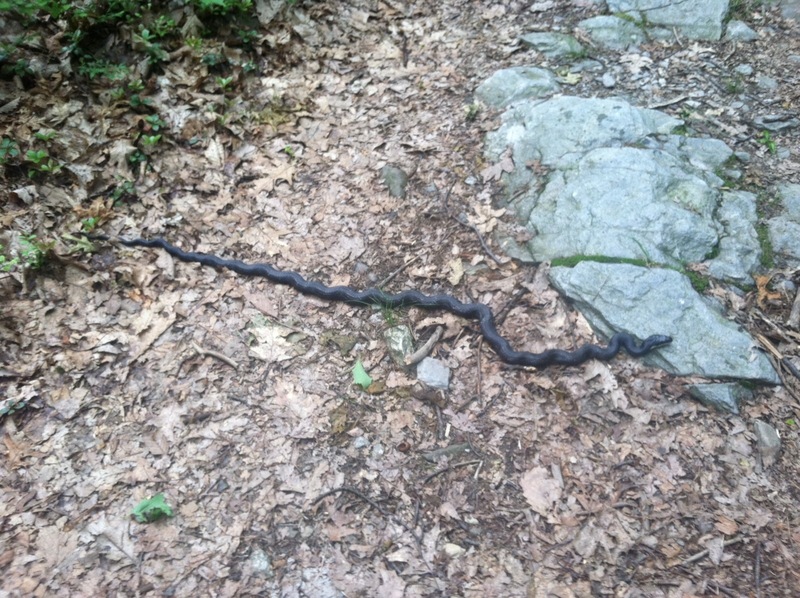 The trail has changed length in its many years, so I’m not surprised that the sign is not at the exact point. Chaser, Prometheus, Phys Ed, Miles, and I all reached the sign together and we were all smiles. Lately, we have been seeing less hikers on the trail, so it was really nice to share such a big moment with our fellow thru-hikers and friends. Wow. 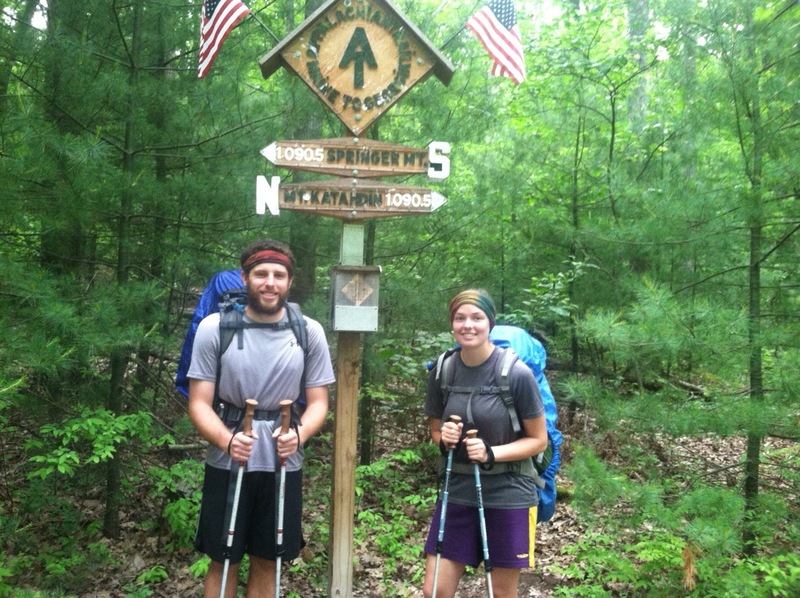 We have hiked over half of the Appalachian Trail! All of the places we are now seeing were only known to me in photos and now that we are actually living it, it still all seems so crazy to me. In only a few days we will have less than 1,000 miles left. I have a feeling that the last 1,000 miles are going to go by very quickly. After taking photos at the halfway point, we booked it to the Pine Grove Furnace State Park. We had been thinking about getting there all day. All week in fact. The general store there is home to the Half-Gallon Challenge. 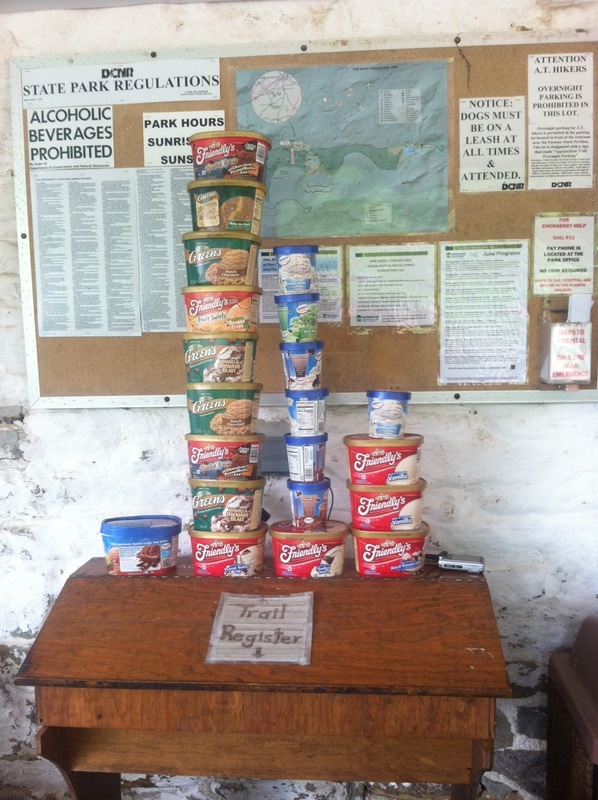 It’s a rite of passage for thru-hikers to eat an entire half gallon of ice cream here. They don’t actually sell half-gallons, so you have to buy a 1.5 quart container and a pint to complete the challenge. There were several hikers there when we arrived. Most of them and finished the challenge. I started out just buying the 1.5 quart of vanilla, because I wasn’t so sure that I could finish all of the half-gallon. We both finished our first containers easily. It was the pint that put me over the edge. I was about 40 minutes in when I began the pint. After about ten minutes, I started to experience dairy and sugar overload. My stomach was telling me to stop, but with everyone cheering me on, I knew that I couldn’t fail. I also knew I would regret not taking those last few bites in the end. No pain, no gain! The last 1/4 of the pint took about 15 minutes to finish as I contemplated giving up altogether. With the positive energy coming my way, I conjured up enough stomach power to scoop up the last few bites and conquer the half-gallon challenge in just over an hour. 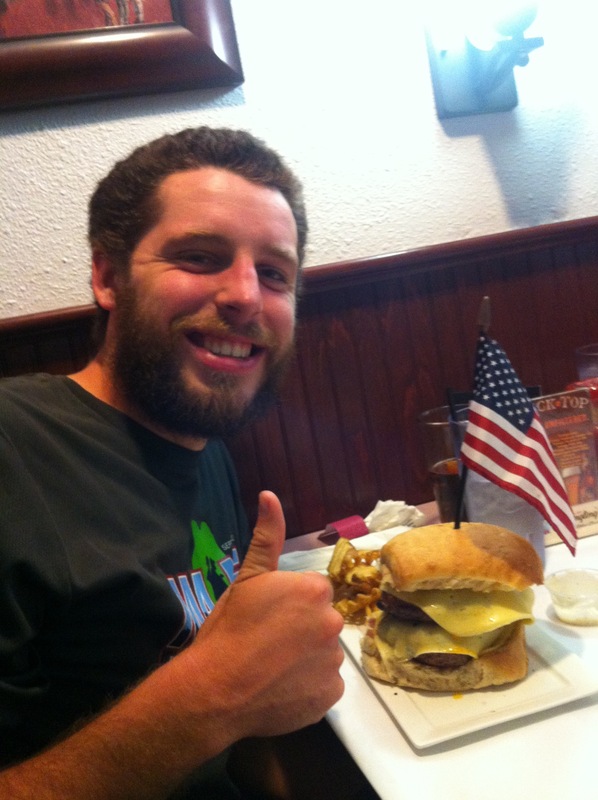 Miles also finished the challenge, but in just under an hour. He felt okay after finishing and I felt sick. Not like I was going to throw-up, just way too full of ice cream. Never again. Like our thru-hike, I think the challenge will be a once-in-a-lifetime experience. I didn’t have time to wallow in my dairy sorrows however, since the AT Museum was closing in ten minutes. Holding my stomach, I walked over to the museum to check out the history it held. It was a great little museum with lots of historical information and artifacts. The highlights were hiking gear from early thru-hikers and an old sign that once sat atop Katahdin. I enjoyed the museum despite my ice cream pain. But do I regret finishing the half-gallon challenge? Absolutely not. After the challenge and museum visit, Phys Ed drove us, Medicine Man, and Kudo into Gettysburg for the night. Who would have thought that this afternoon we would be heading into Gettysburg? When we arrived to Phys Ed’s house, we aired out our gear and relaxed for a bit. We met his wife and one of his sons before taking showers and heading out to the battlefield at sunset. What a beautiful place where such a bloody battle raged 150 years ago. The sun set below the mountains as we explored the Pennsylvania Monument. We climbed to the top of the monument where we had amazing views of the battlefield and mountains in the distance. As we were leaving to go back to the car, we all stopped for a moment to read Lincoln’s “Gettysburg Address.” A speech so simple, yet so powerful and meaningful. A two minute speech that said everything that needed to be said in such few words. 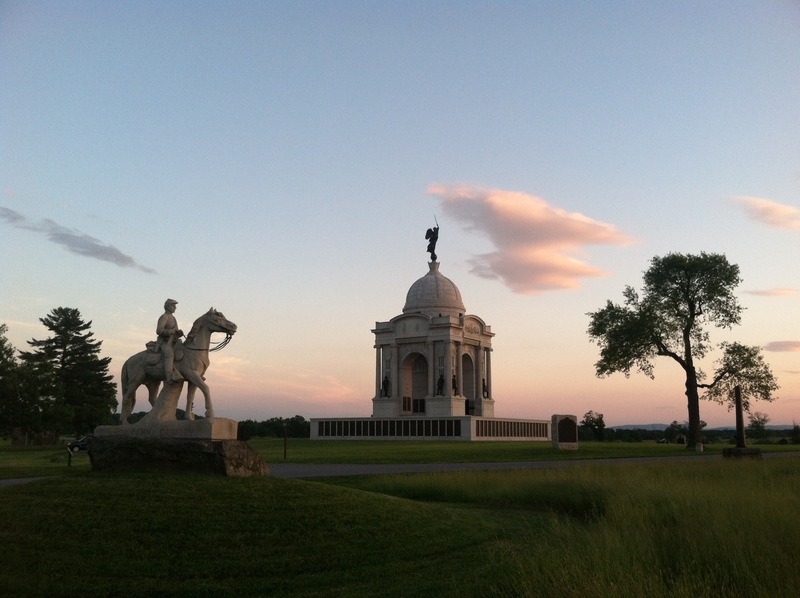 We plan to explore Gettysburg more in the morning before Phys Ed takes us back to the trail. While he went and had dinner with his family, the four of us went to Blue and Gray for burgers and to watch the Bruins game. I got the Howard Burger that had a blueberry chutney, caramelized onions, and Havarti cheese. So good! Phys Ed and his family have been amazing hosts for us. He let us drive his car to the battlefield and to dinner, let us do laundry, and dry out all of gear everywhere. Trail magic really is something else, but good people willing to do anything to make you comfortable, well that’s just perfect. Figured if you guys hike at 1.5 mph for 8 hrs a day you’ll be in Baxter around August 17.hope that’s encouraging. This is just average and the trail changes as you know. Good luck! Congrats on you two making the halfway point and conquering the half gallon challenge!! Quick question, now that you’re past halfway, how is your main gear holding up? (pack, tent, sleeping bag) Thanks in advance! And as always you’re doing a great job on the blog!! Yeah for halfway there! PA is our neighbor so hopefully we’ll be able to meet up with you soon! Feel free to make requests! 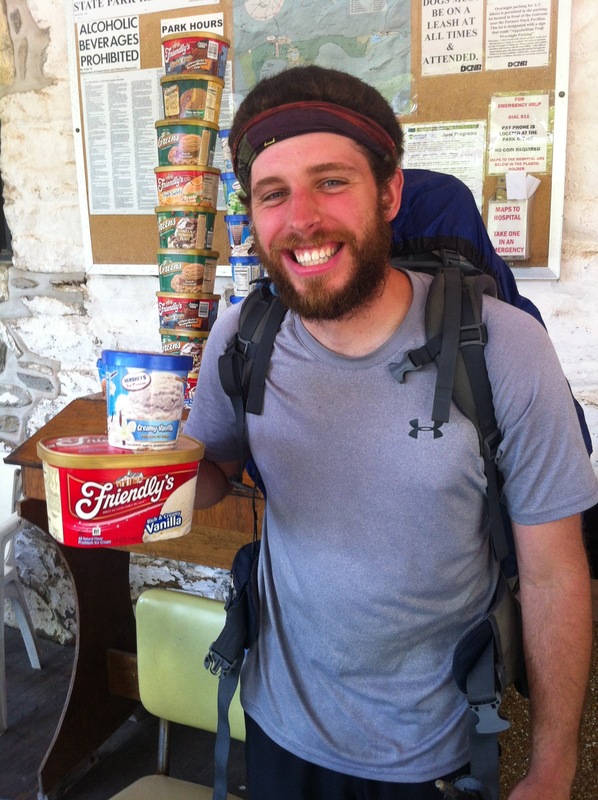 We look forward to the half-gallon challenge also, but we need to have some vegan ice cream brought in for us! 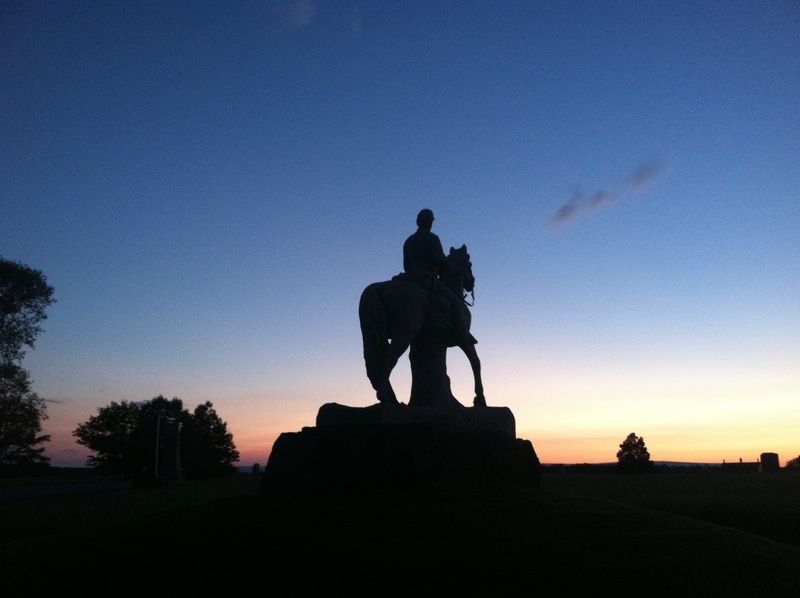 ← Surprise visit to Gettysburg!